The residents, business leaders and professionals who worked together to create this Trinity River Comprehensive Land Use Plan imagine a future for this part of Dallas that is quite different from its recent past. The 2050Vision Statement describes the community they intend to create by approving and carrying out this plan. Five objectives for future development in the Trinity Corridor add detail to the 2050 Vision Statement. They provide guidance that shapes this plan's recommendations for each part of this very large corridor. The five objectives are: Reconnect North and South Dallas, Establish the role of economic development along the Trinity River, Create a vibrant central city, Establish the Trinity River floodplain as the front yard of the City, Enhance the City's urban form to increase the appeal of urban life. The 2050 Vision of the Trinity River Corridor Comprehensive Land Use Plan provides the opportunity to bring together the two halves of the city - the area north of the Trinity River and the area south of the river. Historically, the river has been regarded as serving a strictly utilitarian purpose - to move flood waters through the city. This attitude caused the river to be a dividing line in the city that has persisted through the decades. In this plan, the river is refocused into a community asset that bonds the city as a whole. It establishes the Trinity River Corridor as an attraction rather than a barrier. Reconnection of north and south will be achieved by creating a series of gateways along the Trinity River and by converting some older existing bridges, such as Continental Street Viaduct, into pedestrian crossings. The plan fosters the development of linkages that connect communities to the river and leads to the creation of amenities within the Trinity River floodplain itself. In addition to these physical connections across the river, this plan also proposes other actions that reconnect Dallas communities to the Trinity. As an example, sections of the river could be identified with names that reference river landmarks, historical and archeological sites, recreational facilities and the river's neighboring communities. Even before the construction of major public infrastructure along the Trinity River, smaller projects can help bring the city together. These include establishing key overlook points along the river where citizens can watch developments within the floodway. These overlooks will become the places where people watch the river's seasonal changes and observe nature or recreational activities in the floodway below. To make the river corridor seamless requires a network of trails that cross the river and connect with destinations in and along the entire river corridor. 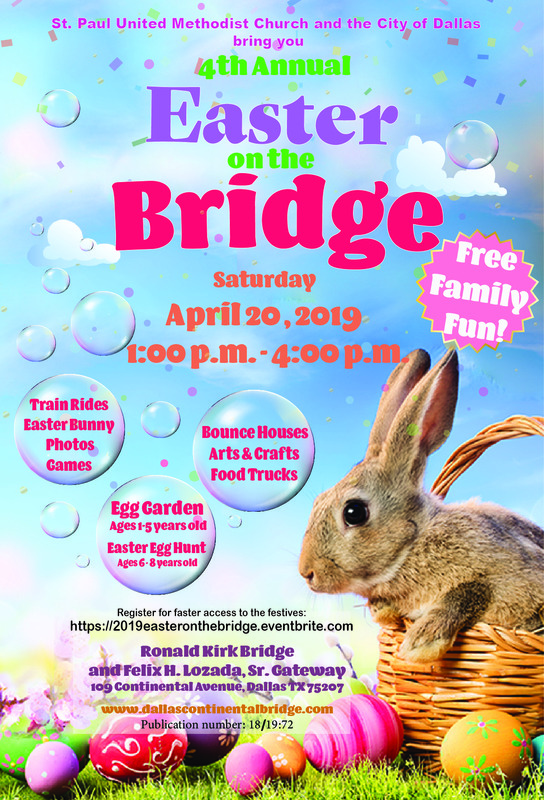 Along the river corridor, other new bridges or pathways might connect key riverside communities, such as connecting Eagle Ford with Brookhollow, linking Oak Lawn with La Bajada and North Oak Cliff, and joining William Blair Jr. Park with Cedar Crest. By 2050, the public and private investments this plan describes should result in a Trinity River that is the center of Dallas and serves as an important part of the communities to the north and south. Dallas needs to capitalize on the significant public investment it is making in the Trinity River Corridor. These public improvements should support new investment by area homeowners, business property owners and developers. These private investments should provide new construction and permanent jobs in the area. They should enhance property values throughout the corridor and, as a result, should generate increased tax revenue for the City of Dallas and other taxing entities. Promoting the City's investment along IH-45 and IH-20 will help to stimulate job growth and new taxes. Partnering with Dallas Area Rapid Transit and developing transit oriented developments at key transit centers along the river corridor will help foster new commercial activity, residential units, and employment. Similarly, partnerships with developers and financial institutions (banks, pension funds, Fannie Mae) will encourage new community investments along the river corridor. The City must explore the use of all available economic development tools along the Trinity River. Creation or expansion of tax increment financing districts, public improvement districts or other special districts will support development of corporate campuses and business relocations. Other economic development initiatives will further tourism in Dallas. These initiatives include efforts to enhance nature and heritage tourism and to create RV parks in the periphery of the river corridor near IH-20. By 2050, the public's investments in the Trinity River Corridor should produce significant returns in economic development and community revitalization in the neighborhoods and business areas all along the river. Unlike many Texas cities, Dallas cannot expand its boundaries outward because it is almost completely hemmed in by its suburban cities. The future growth and development of Dallas must be refocused inward to developing an exciting and healthy central city. The Trinity Corridor plays an important role in the creation of a dynamic central city. This plan recognizes the need to connect downtown to the river and develop a riverside levee-top promenade. Such linkages will encourage 'street theater' both in downtown and along the river. They create a central city that will be one of the most multi-cultural, stimulating, tolerant, and entertaining places in the region. Dramatic new landmarks in the Trinity River floodway will strengthen the identity of the central city and will create destinations for residents and visitors. Among these landmarks are signature bridges over the Trinity River and two new lakes between downtown and Oak Cliff. Signature bridges should lead to investment in signature boulevards into and through the city center. Within the river corridor, this plan encourages the use of light, water, and new technologies to create an ever-changing display that delights the visitor's senses. Another concept that could bring increased vibrancy to the center city is construction of levee gates to provide easy access and connection between the recreational amenities inside the levees and the living, working, shopping, and entertainment activities on the developed side of the levees. Incentives will be needed to stimulate growth in the central city and along the river corridor. Incentives will encourage the development of over 60,000 varied types of housing units in the central city area. They should foster continued improvements at Dallas Independent School District campuses and support private educational institutions in the central city area - both important assets for families considering an urban lifestyle. The Trinity River Corridor of 2050 will be an exciting and desirable urban center for our city and the larger Dallas-Fort Worth region. In the past, the Trinity River floodplain has been a forgotten and neglected back yard while Dallas focused its attention on growth in other parts of the city. An important objective of this plan is to return Dallas' focus to the river and make the floodplain area the front yard for all the communities and districts it touches. Its amenities should be the impressive foreground in views of the Dallas skyline; they should also be the neighborhood front yard where local children play and adults enjoy nature. Several concepts contained in this plan help achieve this objective. Its land use and urban design recommendations create development facing the river. New mixed use communities are located where the river, lakes and other features create distinctive identities and assets for future residents and visitors. Current barriers to river access should be removed or overcome, so riverside neighborhoods have unlimited access to the river and other features in the floodway. Two of the concepts that achieve this objective are connection of the meanders (the old river channel) with today's main river channel via levee gates to offer floodplain-level access; and provision of canoeing options down the old river channel tied to periodic releases from Lake Lewisville. Several public improvements along the river will make the Trinity a front yard for play. 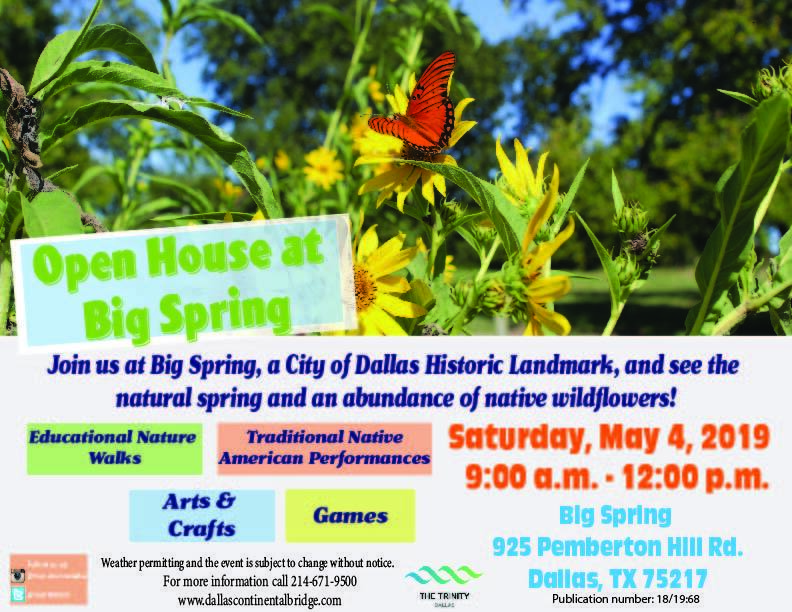 An amphitheater on the West Dallas/Oak Cliff side of the floodway, boat launches at Sylvan Avenue and South Loop 12, the Trinity Audubon Center, the Great Trinity Forest and the Trinity Horse Park provide many choices for entertainment, education and enjoyment. Boardwalks near lakes, wetlands, and treetop level observation towers within woodlands and promontories offer additional destinations for neighborhood residents and visitors to Dallas. Significant places for public gatherings will make the Trinity the front yard for major civic events and celebrations. Major plazas and overlooks will create gathering places for events such as fireworks displays or citywide festivals. Special interest gathering places are also encouraged, such as pooch parks for dogs and their two-legged friends and kite parks for those who want to take off the day and catch the wind. The Trinity River floodplain of the future will be an area with restored and revitalized natural ecosystems. The Great Trinity Forest, a tree-lined and meandering river channel, lakes of varying size and character, meadows and wetlands are all part of this vision. These natural features provide important environmental benefits; they also offer places for solitude and contemplation of nature in the center of the city. The destinations described above will give people reasons to come to the Trinity River. Networks of trails will offer choices for people as they seek these destinations. 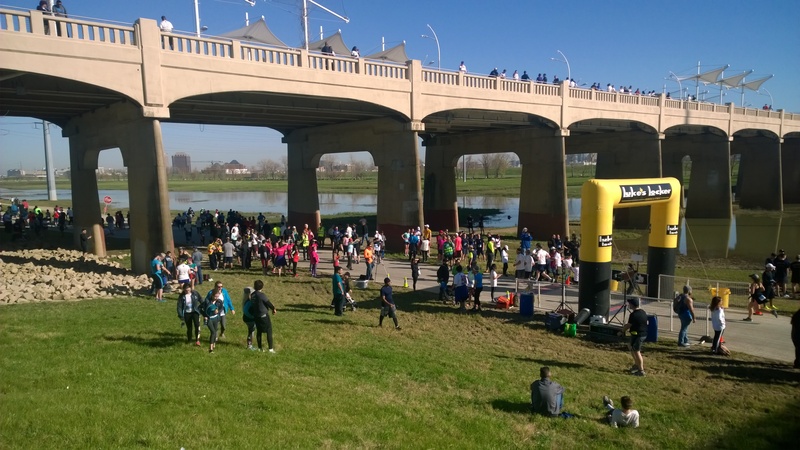 The river floodplain will serve as the hub for a radiating hike, bike and equestrian trails system that connects Trinity destinations with Dallas neighborhoods and with the larger region. Public transportation will be a very attractive option for park users; DART's light rail station at 8th and Corinth will link directly to Moore Park, a major gateway into the Trinity River area. The river itself will be a route for canoe and kayak trips and these boating choices expand the possibilities for travel to and from area destinations. By 2050, the Trinity River floodplain will be cherished as the front yard for its neighboring residents, the primary gathering place for the Dallas community and the most remarkable natural destination for national and international visitors to this major urban area. This plan for the Trinity River Corridor is designed to strengthen the urban core of Dallas and the region. It will counter the perception that 'beings uburban is desirable' by designing places where 'being in the central city is fun, aesthetically exciting, and attractive.' Urban form - the design of the public and private spaces that will line the future Trinity River - is a prime consideration in the land use plans, urban design concepts and implementation recommendations found in this plan. More detailed urban design plans for specific riverside communities will be created to follow and further detail the urban form recommendations in this plan. High urban design standards are needed for the streets, opens paces and buildings along the Trinity. Strategically-placed urban parks of ten acres or larger will offer inspiring urban vistas and will shape the character of surrounding neighborhoods. Attention to the details of public art, building placement and mass, view sheds, streetscape and landscape design will result in communities that are distinctive as well as desirable. Inclusion of natural areas and features will reveal the beauty of the river and make Dallas' urban form even more unique among major cities. The urban areas along the Trinity River in 2050 will exemplify the best in21st century city design - distinctive places for living, working and playing that link to one another and connect to Dallas' natural setting in a way that is both engaging and sustainable. On August 9, 2017, the Dallas City Council eliminated any consideration of the Trinity Parkway Alignment 3C from the Balanced Vision Plan through Resolution 17-1200 which states it is no longer part of the Balanced Vision Plan and will not be constructed. The Balanced Vision Plan was originally adopted by the then Dallas City Council in December 2003, establishing the design and interaction among the major public improvements that contribute to the overall Trinity River Corridor Project. This plan proposes public and civic investment in the Trinity River Corridor of over $1.7 billion during the next twenty to thirty years. These public improvements are intended to maximize the opportunities for community revitalization and economic development in the areas along the river. Thus, the framework concepts guiding public investment provide a foundation for the concepts directing land use and development. Flood Protection Framework Concept: A balanced vision for flood protection throughout the Dallas - Fort Worth Metroplex must include efforts to manage growth's impacts on the watershed region wide along with investments to minimize the impacts of flooding on specific neighborhoods and business areas. Framework Concept: The Trinity River will become a source of pride for Dallas, with a new sustainable park environment that reveals the now hidden treasures of the Great Trinity Forest and the Trinity River. A Trinity Central Park within the Dallas Floodway will knit scattered recreational facilities into one system. Combined with regional open space and trail networks, the entire system creates the largest urban park in the nation. A multi-modal transportation system must be built that meets projected regional travel demands. It must also be designed to be compatible with adjacent parks, neighborhoods and business areas. The Trinity River Corridor's 2050 Vision Statement and Objectives must be translated into more specific recommendations for land use and development if they are to become reality. A set of five Framework Concepts guide the plans for areas within the corridor. These concepts are summarized in text and illustrated with conceptual maps for the entire Trinity River Corridor. These Framework Concepts shape the specific land use recommendations for the entire corridor and offer detailed development concepts for key locations within the corridor. Open Space and Environment Framework Concept: Planning for the Trinity River Corridor begins with planning for enhancement of the river and the natural environment. This open space corridor - and the water, land and ecosystems it contain - is the central defining feature that connects the communities along the river and makes them different from other places in the city or region. Land Use Framework Concept: The Trinity River Corridor includes parts of downtown, industrial and residential districts, and vacant, undeveloped and undeveloped areas. The plan for its future must consider the existing character and assets of each area within the corridor, and must use these assets to create varied and distinctive communities. People should have a variety of transportation choices for travel. The design features of the public improvements establish a standard of excellence that define nearby areas and create an expectation for comparable quality in future private development. Certain areas within the Trinity River Corridor play particularly valuable roles in achieving the 2050Vision. The development visions for these areas are part of the framework for land use planning of the entire corridor.